If you are in the process of migrating from earlier versions of Exchange such as Exchange 2003 to Exchange 2010 or even to Office 365 URL redirects is a very useful setup to allow a single URL to re direct to multiple locations depending on where users are hosted. Warning: It’s very important that you check the checkboxes exactly as shown in the screenshot above! If the customer wants to browse http://cas01.customer.com, you’ll get an HTTP 403.4 error at this stage. This is because SSL is required at the top-level website. In order to get the redirect working, we need to disable SSL for the toplevel website while leaving it enabled for the relevant child virtual directories. 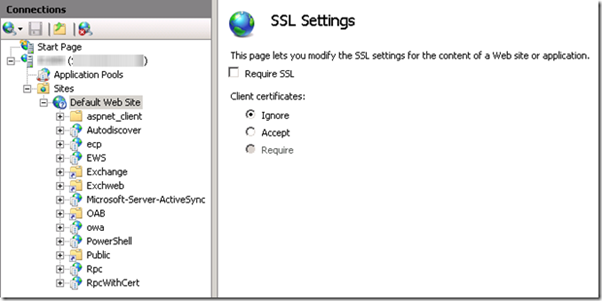 Warning: If you require SSL for the PowerShell virtual directory, you will render Remote PowerShell inoperable! Once you’ve configured the redirection and SSL settings, open a command prompt and run iisreset.